The Harlequin is in a charming terrace of houses, built in 1822–4. The earliest record we can find of a pub here is 1848 when John Gray is listed in the rent books as running a ‘beer shop’. Historic records show that the shopkeepers and trades at work in Arlington Way changed around pretty frequently. In the years before the pub, the house had been home to James Hoare, a baker (1841), and Robert Cruttwell, a lithographer and printer (1845). As well as shops, early businesses in the street included gem-cutting and ivory-working. 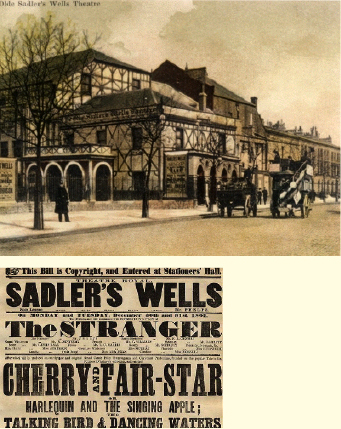 The pub’s name reflects the 19th-century heyday of early English pantomime when the great comic actor Joseph Grimaldi was the star performer at Sadler’s Wells Theatre next door. The pilastered front, that still survives today, dates from 1894. This replaced the bowed glazed shopfront that was originally common to all the houses in the terrace. Only one of these remains, next door to The Harlequin at No 26.